Get Ready for a Sneak Peek of Impact Thrift! It's almost here and we're getting a special preview! For the past few months, I've dreamed of the day I get to roam the aisles of the new Impact Thrift. I imagine thumbing through the books, tearing into the racks and racks of clothing and maybe even doing a little jig down the bric-a-brac aisles. The Impact Thrift soon to open in Feasterville, PA promises a magical land of secondhand treasures, all ready for the plundering. And how vast is this thrifty promised land? Oh only the largest of the Impact chain, The Feasterville Impact will be home to a mere 40,000 square feet of secondhand treasures. And waking from my daydreams of antiquarian books, kitsch knick knacks and a sea of vintage clothing, it suddenly occurred to me: I have never pursued the opportunity to see thrift store operations from a behind-the-scenes vantage point. But tomorrow, dear readers, all that will change. 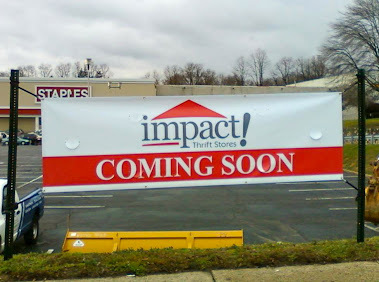 With special accommodations made by Jill Tarabar, the Assistant Director of Business Development and Social Media Manager for Impact, I will be visiting the new location of Impact Thrift, just a few weeks prior to the grand opening for a tour of the sales floor and all the magic that happens in the back room. I'll be interviewing the staff, taking photos and getting an idea of what it takes to open a thrift store to the public. You've seen some of my own found treasures from Impact Thrift Stores. Now you'll get to see how those treasures are received, processed and priced all in preparation for the doors to open to an eager public. And on Saturday April 21st, I will also be on-hand for more interviews, photo ops and to take part in the grand opening celebration of the Feasterville Impact! For all of you local thrifters, the Feasterville Impact is located in the Bucks Crossing Shopping Plaza at Street Road & Bustleton Pike. The grand opening celebrations will begin at 10 am with a ribbon cutting ceremony and will include family-friendly activities, door prizes, discounts and will conclude with an incredible runway fashion show of just some of the trendy thrifted wares Impact has to offer. Now, I haven't seen anything yet. But the excitement is palpable. And after tomorrow's initial interview and behind-the-scenes tour, I'm sure I'll be crossing off the days from my calendar until the big opening! What would you most like to know about the inner-workings of Impact Thrift Stores? I'm not local...but how exciting!! I love a good thrift store! Thanks for the comments! The interview was an excellent experience, such a great opportunity to meet people passionate about what they are doing in the community, philanthropically speaking. And in terms of the shopping. The space, MY GOD, the space! This thrift store...will be legendary. I can't wait to share all of this with you. It's a shame not be local to the area...but if you ever find yourself in the neighborhood, it will be a guaranteed must-see attraction.